Hanging Rock bushwalk, Blue Mountains. 12km return. Amazing views. Hanging Rock Bushwalk, Blue Mountains. Sometimes bushwalking is all about the journey. 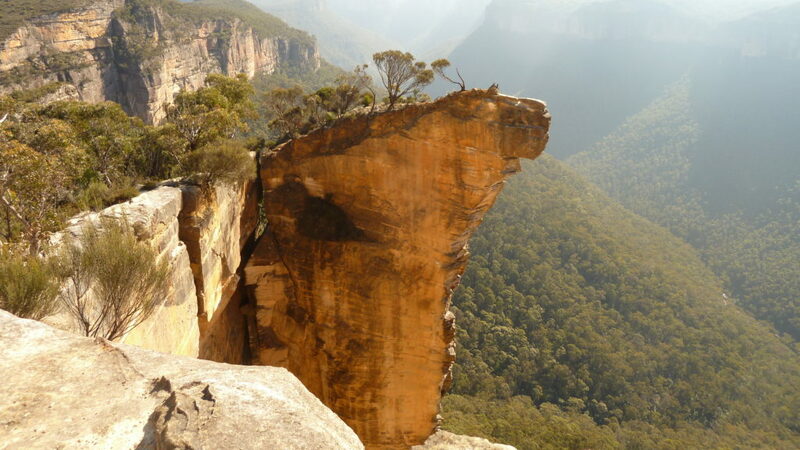 But Hanging Rock in the Blue Mountains is definitely all about the destination. The views overlooking the Grose Valley at Baltzer lookout or Hanging Rock are absolutely spectacular. Hike on the Burramoko fire trail for about 5km. At the end of the trail you have a short bushwalk to hanging rock. I highly recommend this bushwalk to Hanging Rock. Directions to Hanging Rock bushwalk, Blue Mountains. Google Map Link. The trail head for the Hanging Rock hike is located at the end of Ridgewell Rd, Blackheath. There are about 2 different tails to choose from. Head straight down Burramoko fire trail. It’s sign posted. Hanging Rock Bushwalk trail map. Hanging Rock Bushwalk Photo Gallery. Hanging Rock Bushwalk youtube clip. Directions to Hanging Rock Bushwalk Bike Ride. 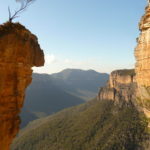 Blue Mountains hiking trails, tracks, bushwalk, blue mountains, Hanging Rock.